AirSep is an innovator in the development and manufacture of Oxygen Concentrators and other oxygen products for both medical and industrial applications. AirSep was founded in 1987 in Buffalo, New York. With global distribution, AirSep provides oxygen applications for hospitals, nursing homes, homecare, mining, steel mills, paper mills, and water treatment facilities. The medical products division of AirSep provides single patient, therapeutic oxygen concentrators that can be used at home or carried with the individual where ever they need to go. AirSep Portable Oxygen Concentrators are leaders in the industry offering Oxygen Therapy patients the smallest and most lightweight concentrators. AirSep Focus Portable Oxygen Concentrator - is a palm sized portable oxygen that is considered a wearable oxygen concentrator. 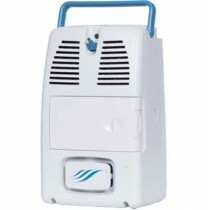 This is the smallest and most lightweight portable oxygen concentrator currently offered for sale. The AirSep Focus Concentrator provides an equivalent of 2 LPM pulse dose oxygen and weighs just slightly above 2-1/2 pounds with a battery. AirSep FreeStyle 3 Portable Oxygen Concentrator - is a pulse dose portable oxygen device that is carried with the oxygen patient where ever they need to go. The AirSep FreeStyle Concentrator provides three oxygen setting selections and can operate on its highest setting for up to 2 hours. AirSep FreeStyle 5 Portable Oxygen Concentrator - is a full-capacity portable oxygen concentrator offering an equivalent of 5 LPM of pulse oxygen. Weighing less than 6 pounds, the AirSep FreeStyle operates for up to 2 hours on a rechargeable internal battery. AirSep VisionAire 5 In-Home Oxygen Concentrator - is a Home Oxygen Concentrator with four caster type wheels for mobility between rooms. The AirSep VisionAire provides up to 5 liters of continuous flow oxygen from a 30 pound concentrator. Producing a low level of noise at only 40 dBA, the AirSep VisionAire is a low cost in-home oxygen solution.